VanDutch boat rental for birthdays, family fun days, anniversaries and private events. The French Riviera is one of the few places that welcomes you with a pleasant climate and unique landscapes throughout the year. Rent a VanDutch boat for a family day out with friends or, just as a couple: Go out and have a wonderful time on a fabulous day-boat. We can take you to the most beautiful coves around Monaco, Cannes, Saint-Tropez, Italy and Corsica where only boats can access the secluded beaches. Click on “Our Destinations” page to plan your day out or leave it up to us to surprise you with the most beautiful spots in the Mediterranean. VanDutch Boat Rental for Events: Rent VanDutch boats to follow regattas in the Mediterranean. Go to Saint-Tropez to follow the Voiles de Saint-Tropez, or the Voiles d’Antibes, Cannes Royal Regatta or the Imperial Ajaccio Regatta in Corsica. 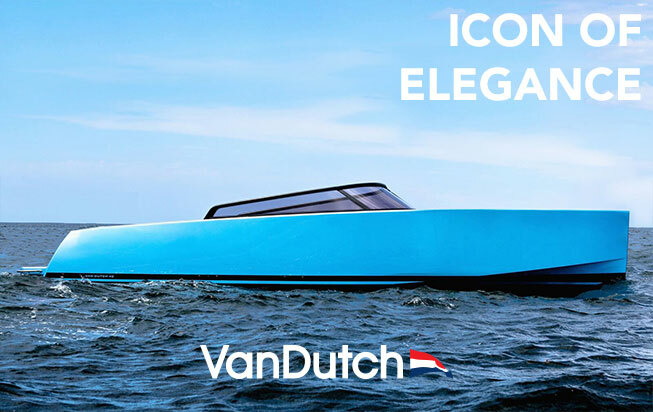 If you are going to the Formula 1 Grand Prix of Monaco, then the only way to get there in style is to rent a VanDutch boat and let us organize your VIP transport to the heart of Monaco to land right on the race track. For all your private events, VanDutch Charter Division provides personalized services. Let us help you plan or even suggest places for you to visit.